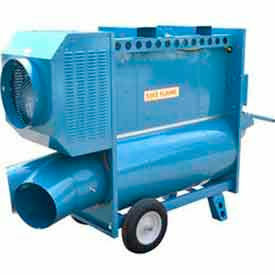 Kerosene Heaters Forced Air Provide Mobile High Heat Output For Construction, Commercial, Industrial, and Other Related Applications. The adjustable temperature control regulates heat allowing it to be set at a desired comfort level. The temperature limit control feature is designed to prevent overheating for unit protection. The flat-free tires provide ergonomic unit mobility and transport for user convenience. The ergonomic carry handle allows you to transport and position the heaters for location versatility. The steel construction is strong and impact resistant making it ideal for harsh working conditions. CSA listed. BTUs, dimensions, and square foot coverage vary per model. Propane Heaters Forced Air Provide Comfortable Heating For Construction, Industrial, Manufacturing, and Other Related Environments. The adjustable temperature control regulates the heat temperature to support various climates. The adjustable heat angle is designed to direct tempered air to cooler areas where heat is required. The ergonomic carry handle allows you to conveniently transport these heaters for easy placement and positioning. The steel construction provides strength and dependability in harsh working conditions. Includes power cord, hose, and regulator assembly. CSA and ETL listed. BTUs, dimensions, and square foot coverage vary per model. Indirect Fired Heaters Oil Series Provide Mobile High Heat Output For Applications Including Construction, Commercial, Industrial, And More. Indirect fired heaters oil series are made of powder coat steel for long lasting durability and corrosion resistance. High pressure operation and four-loop exhaust gas system provides higher unit efficiency. Large fuel tank with cap gauge provides extended run times for temporary or long heat requirements. Dual fuel capability provides fuel and application versatility. Low power consumption. Fuel type is Multi. CFMs range from 1020 to 3250. BTU highs range from 110,000 to 412,000. Color finish is White. CSA certified. Dimensions vary per model. Make Up Air Heaters Concealed Flame Provide Mobile High Heat Output For Applications Including Construction, Commercial, Industrial, And More. 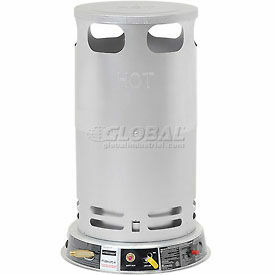 Make up air heaters concealed flame are made of steel for long lasting durability and dependability. Air flow switch ensures safe fuel shutdown if combustion air is interrupted. Flame safeguard control allows safe combustion monitoring for unit and user safety. Double layered combustion chambers provide quiet operation and low surface temperatures. Dual fuel capability provides fuel and application versatility. Hi limit switch protects heater from over-firing. Fuel type is Multi. CFMs are 6000 and 7000. BTU highs range from 400,000 to 1,200,000. Available color finishes are Blue and White. CSA certified. Dimensions vary per model. 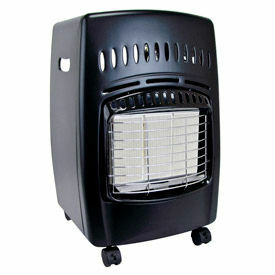 Indoor Kerosene Heaters Are Used For Homes, Basements, Garages, Cabins And Other Small Heating Applications. 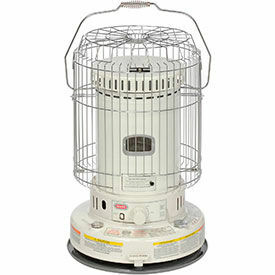 Indoor Kerosene Heaters are solidly manufactured for long lasting durability and dependability. The Dyna-Glo Delux brand offers various type and design units that provide safe, supplemental heating options. No electricity required. Selected features include Mechanical Tip Shut-Off Assemblies, Push Button Electric Ignitions, Run-Time Fuel Gauges, One Touch Extinguish Systems, Convenient Handles and more. 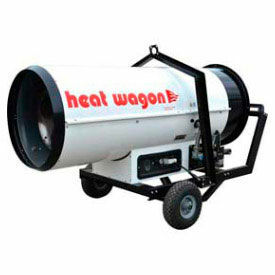 10000 to 23000 BTU heaters provide 500 to 1000 square feet of coverage with from 8 to 13 hour run times. 1 and 1.9 gallon tank capacities. Replacement wicks sold separately. Direct Fired Heaters Dual Fuel Provide Mobile High Heat Output for Applications Including Construction, Commercial, Industrial, and more. 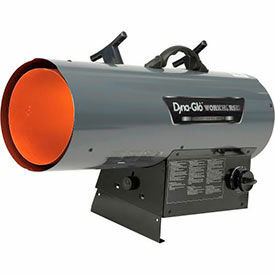 Direct fired heaters dual fuel are made of steel and sheet metal for durability. Air flow switch ensures safe fuel shutdown if combustion air is interrupted. Flame safeguard control allows safe combustion monitoring for unit and user safety. Double layered combustion chambers provide quiet operation and low surface temperatures. Dual fuel capability provides fuel and application versatility. Hi limit switch protects heater from over-firing. Fuel types are Multi and LP/NG. CFMs range from 650 to 16,000. BTU highs range from 100,000 to 3,500,000. CSA certified. Dimensions vary per model. Portable Convection Heaters Provide Powerful Instant Heat With No Electricity Required. Durable, heavy duty 2-piece burn chamber. Operates using a standard propane cylinders (not included). Auto-shut off feature shuts off unit if flame is extinguished. Includes Piezo start ignitor, 10L hose and regulator. 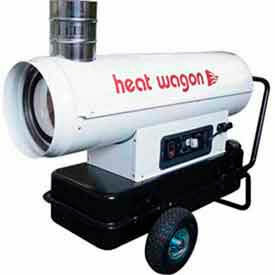 Offers 360° heat radius and variable heat output control. Inner wind shield for added safety. CSA approved. Not for use in residential living areas or in inadequately ventilated areas. Proper ventilation required during operation. 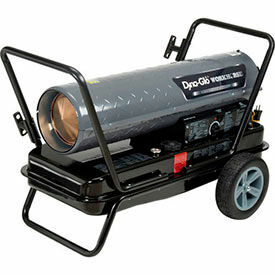 Portable propane heaters are made of high quality materials for strength and durability. Integrated oxygen depletion sensor turns heater off in unsafe oxygen levels for safe indoor use and emergency heating. Tip over switch automatically shuts off flame for fire prevention and safety. Some models feature an integrated Piezo-ignition and swivel regulator for easy propane tank attachment. Ships assembled with no electricity or batteries required. Tank not included. 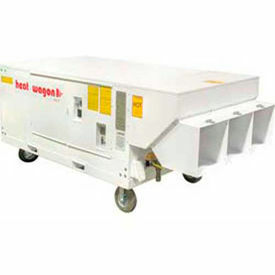 Heat coverages are 200, 250, 400, 450, and 600. BTUs are 9000, 10000, and 18000. CSA approved. Dimensions vary per model. 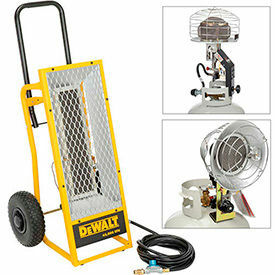 Radiant Heaters Provide Heating for Workshops, Construction Sites, Garages, and more. Radiant heaters are made of steel for strength and durability. Integrated tip over switch automatically shuts off flame for fire prevention and safety. Includes wind resistant burner system, corrosion resistant emitter guard, rear safety guard, and high efficiency reflector for heater and user stability. Features shut-off valve and variable heat control valve for unit protection and operation control. Proper ventilation required during operation. Tank not included. Available fuels are Kerosene, Multi, Natural Gas, and Propane. BTUs range from 15,000 to 250,000. Dimensions vary per model. Indirect Fired Heaters Gas Series Provide Mobile Indoor Heating For Applications Including Commercial, Industrial, Residential, And More. Indirect fired heaters gas series are made of steel for long lasting durability and dependability. High pressure operation and four-loop exhaust gas system provides higher unit efficiency. Includes pneumatic wheels for convenient mobility and transport. Dual fuel capability provides fuel and application versatility. Optional remote thermostat available. Fuel type is Multi. CFMs range from 800 to 6,475. BTU highs range from 112,141 to 1,000,000. Available color finishes are Blue and White. CSA certified. Dimensions vary per model.